A couple of weeks ago, Ben Yagoda wrote a post on Lingua Franca in which he confessed to being a whomever scold. He took a few newspapers to task for messing up and using whomever where whoever was actually called for, and then he was taken to task himself by Jan Freeman. He said that “Whomever Mr. Trump nominates will inherit that investigation” should have the subject form, whoever, while she said that the object form, whomever was indeed correct. So what’s so tricky about whoever that even experts disagree about how to use it? To answer that, we need to back up and explain why who trips so many people up. Who is an interrogative and relative pronoun, which means that it’s used to ask questions and to form relative clauses. One feature of both questions and relative clauses is that they cause movement—that is, the pronoun moves from where it would normally be in a declarative sentence to a position at the beginning of the clause. For example, a sentence like You gave it to him becomes Who did you give it to? when made into a question, with the personal pronoun him being changed to who and moved to the front. Or a pair of sentences like I gave it to the woman. I met her at the conference becomes I gave it to the woman who I met at the conference. Again, the personal pronoun her is replaced with who and moved up. 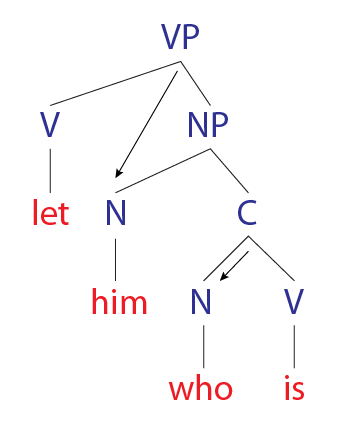 Technically, both of these examples should use whom, because in both cases it’s replacing an object pronoun, and whom is the object form of who. But we often have trouble keeping track of the syntactic role of who(m) when it moves, so many people just who regardless of whether it’s syntactically a subject or object. Sometimes people overcorrect and use whom where it’s syntactically a subject, as in Whom may I say is calling? Whoever adds another layer of complexity. It’s what we call a fused relative pronoun—it functions as both the relative pronoun and its own antecedent. Let’s go back to our example above: I gave it to the woman who I met at the conference. The antecedent of who is the woman. But we can replace both with whoever: I gave it to whoever I met at the conference. Subject of main clause, subject of relative clause: Whoever ate the last cookie is in trouble. Object in main clause, subject of relative clause: I’ll give the last cookie to whoever wants it. Subject of main clause, object in relative clause: Whoever you gave the last cookie to is lucky. Object in main clause, object in relative clause: I’ll give the last cookie to whoever I like the most. So if whoever can fill two different roles in two different clauses, how do we decide whether to use the subject or object form? Which role wins out? The rationale for this rule is that the relative clause as a whole functions as the subject or as an object within the main clause. That is, the relative clause is treated as a separate syntactic unit, and that unit is then slotted into the main clause. Thus it doesn’t matter if whoever follows a verb or a preposition—the only thing that matters is its role in the relative clause. I think this is easier to understand with sentence diagrams. Note that in the diagram below, whoever occupies a place in two different structures—it’s simultaneously the complement of the preposition to and the subject of the relative clause. Syntax diagrams normally branch, but in in this case they converge because whoever fuses those two roles together. Grammatical case is governed by the word on which the pronoun is dependent, so we can think of case assignment as coming down from the verb or preposition to the pronoun. 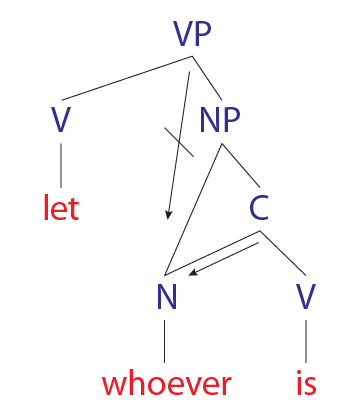 In the diagram above, the case assignment for whoever (represented by the arrows) comes from its role in the relative clause. Normally the preposition to would assign case to its complement, but in this situation it’s blocked, because case has already been assigned at the level of the relative clause. Of course, case in English has been a mess ever since the Norman Conquest. English went from being a highly inflected language that marked case on all nouns, pronouns, and adjectives to a minimally inflected language that marks case only on a small handful of pronouns. Our internal rules governing pronoun case seem to have broken down to some extent, leading to a number of constructions where subject and object forms are in alternation, such as between you and I or me and her went to the store. The Oxford English Dictionary has examples of whomever being used for whoever going all the way back to John Wyclif in 1380 and examples of whoever being used for whomever going back to Shakespeare in 1599. Which brings us back to Yagoda’s original post. The sentence that brought correction from Jan Freeman was “Whomever Mr. Trump nominates will inherit that investigation.” Yagoda said it should be whoever; Freeman said it was correct as is. Yagoda eventually conceded that he was wrong and that the Times sentence was right, but not before a side trip into let him who. Freeman linked to this post by James Harbeck, in which he explains that constructions like let him who is without sin don’t work quite the same way as let whoever is without sin. A lot of people have learned that the clause with whoever essentially functions as the object of let, but many people then overextend that rule and say that the entire construction he who is without sin is the object of let. To understand why it’s not, let’s use another syntax diagram. Note the differences between this diagram and the previous one. Him is the object of the verb let, and who is . . . is a relative clause that modifies him. But, crucially, him is not part of that clause; it’s merely the antecedent to the relative pronoun. Its case assignment comes from the verb let, while the case assignment of who comes from its role in the relative clause. For he to be the correct form here, its case would have to be controlled by the verb in a relative clause that it’s not even a part of. Case assignment essentially flows downhill from the structure above the pronoun; it doesn’t flow uphill to a structure above it. Some of the commenters on Yagoda’s post, though, had an elegant test to show that Yagoda was wrong without resorting to syntax trees or discussions of case assignment: simply remove the relative clause. In Let him cast the first stone, it’s clear that him is an object. The relative clause may add extra information about who exactly is casting the first stone, but it’s grammatically optional and thus shouldn’t affect the case of its antecedent. In conclusion, case in English is a bit of a mess and a syntactic analysis can help, but sometimes the simplest solutions are best.